New model, seems to be made by same company as 1400LM and 800LM lights. Useful as small ring or hair light also. I know it's childish, but it does make the camera look like a little robot. I like the compact size tho. It doesn't seem like there's any diffusor or Color Temp filter that comes with it. >It doesn't seem like there's any diffusor or Color Temp filter that comes with it. Use gels, most probably free sampler will suffice. It intentionaly looks that way. Notice the name; "Walli". I seem to remember a Pixar film by the name "Wall-E"
>I seem to remember a Pixar film by the name "Wall-E"
Yep. Good animation film :-) And smart name and design of light. My understanding that besides battery plate all this thing is metal (including hotshoe mount), at least LM-1400 is. Brightness must be more than 5600k 312A light. We have small deal for our members on this light, contact me via PM if you want to get it for $94,99. 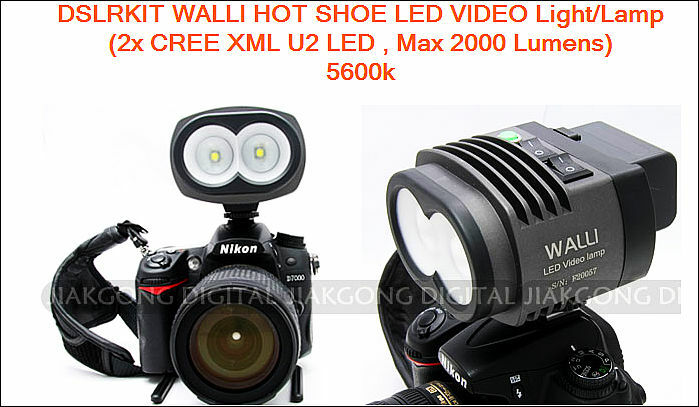 Vitaliy, have you compared this Wall*E light to the Z96? If it's brighter and can run longer on a Sony battery it's a winner, especially at that size. It is brighter. As far as I know it uses one of the most effective LED emitters. About battery. It depends on a battery. Try large Sony one. It'll clearly be champion. That is the same one right? As far as I know, it is same seller, just price is in AU. *did someone give a try? *they send the light with a white diffuser but no orange filter (cto) ? ??? so nobody bought this item ??? I've used this item for a hair light with a magic arm from manfrotto. Worked great. Be careful as it gets hot. You can easily use gel samples if you wanna color correct for tungsten setups. You can see an example of it in action in the interview and tasting shots here. Anyone using this? I got it recently looking for something more powerful than Z96 but smaller than 312A. Very unimpressed by this light because of the high frequency ringing that I get on any output level other than maximum. The GH2 mic picks it up like hell. Anyone experiencing that problem or is it just mine? The real measured output is 400 lux for 5600K LED and 710 lux in 5600/3200 mixed mode at 1 meter. For comparison the Z96 yields 475 lux and 312A - 1540 lux. It's a bit heavier than Z96 and has much narrower angle which is what I like about it but some people will not. Gets really hot when you use it. Doesn't have DC input.